As Sikhs, the life of a householder is a big part of our life. We have heard from lots of Sikhs asking questions about relationships, marriage and child raising. Actually a HUGE portion of the questions that we get from people in the SikhNet Q&A forum are in this category. So to help with this we decided to produce a series of video on these topics. We had the first recording session last week with two couples, Guruka Singh and his wife Guruka Kaur (The elders perspective) and myself with my wife Arjan Kaur (The younger married couple). We had planned to record for a bit over an hour and it turned into 3 hours! There was so much stuff to talk about. After it was all done, it seemed that we had hardly scratched the surface of the issues to discuss. We had fun with a surprise turning of the camera. After we finished the married couples part, we put Gurujot Singh and his twin brother Harijot Singh on the spot asking them some of the same questions, but this time in relation to being single/unmarried. So stay tuned every week for new videos that we will be posting as they are edited. This is the introduction to SikhNet’s new Relationship Series. 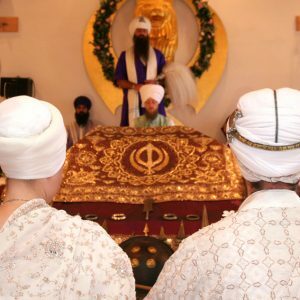 Gurumustuk Singh and his wife Arjan Kaur, Guruka Singh and Kaur talk about marriage. If life were a martial arts system then being married with kids would be the black belt. With divorce being so common in the west and young people having to decide if marriage is worth it these couples were asked what is the value of marriage. They all give some great insights: marriage is not confining it’s freeing. It seems there is a lot of material and I just saw 6 mins of it. can you please publish more? Can you also please try and have a webcast where we can have an interactive session? Narayan Dancing - Narayan doing a dance and just having fun being a kid.